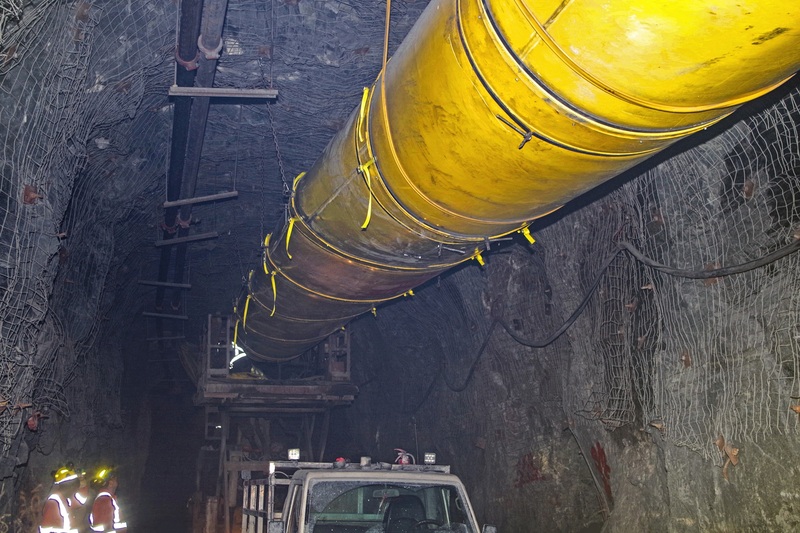 54 in vent line installation at the Goldcorp Borden Gold Project, Chapleau (Ontario). 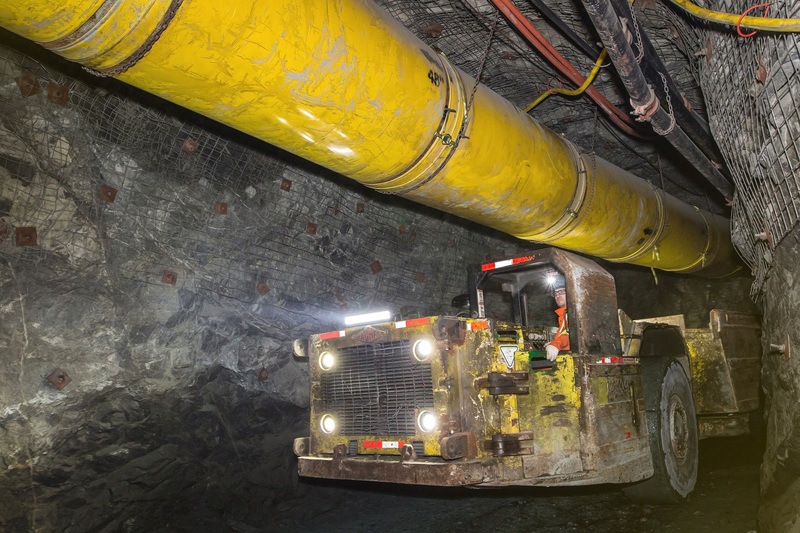 54 in vent line at Glencore Canada's Bracemac-McLeod mine, Matagami (Québec). 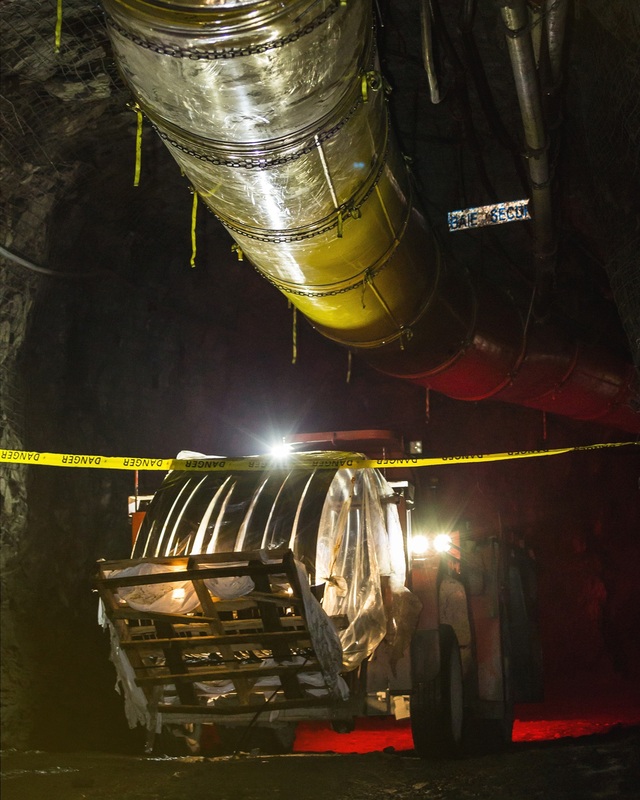 42 in oval ducts at Wesdome's Kiena mine, Val-d'Or (Québec). 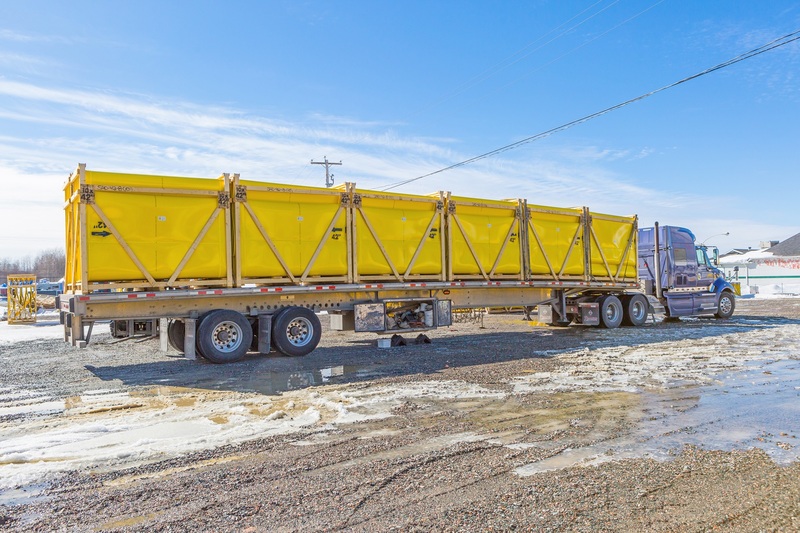 Assembly by the CMAC-Thyssen Mining Group. 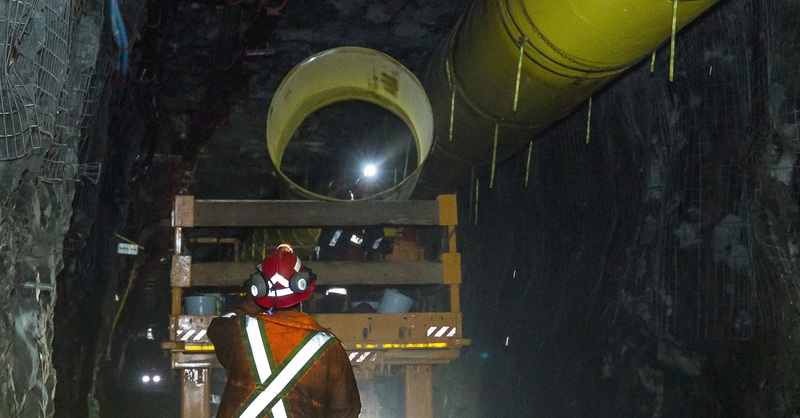 3+ years old 48 in duct at Agnico Eagle's LaRonde mine, Preissac (Québec). 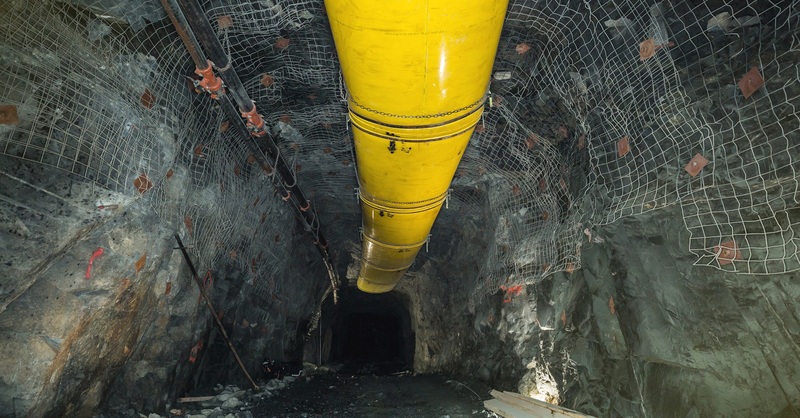 54 in vent line at Alamos Gold's Young-Davidson mine, Matachewan (Ontario). 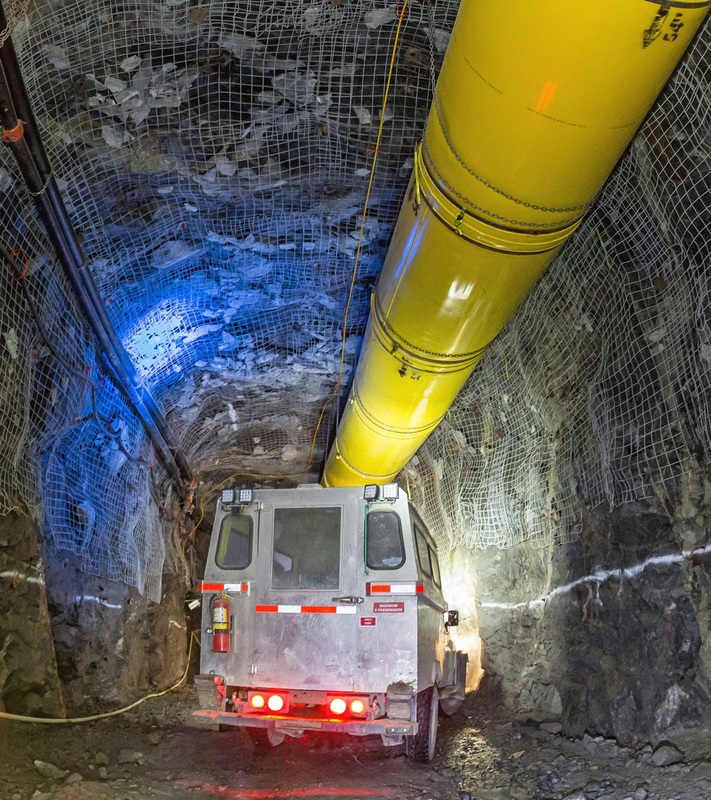 The last decade has seen the advent of a new type of mine ventilation, which uses widespread vent tubing systems that extend over hundred metres, if not kilometres. Such design calls for ductwork that can deliver air over such distances while minimizing vent line energy consumption. In 2010, we developed the G+ SPEED AIR DUCT, an airtight, smooth-walled tubing that meets the new requirements of mine ventilation. Its heavy-duty plastic material, which contains a fire-retardant additive, makes the G+ SPEED AIR DUCT safe, light, flexible and durable. The G+ SPEED AIR DUCT stands out from all other ventilation tubing because of its smooth walls and improved couplings. Made of HMW polyethylene, a low-friction material, the ducting opposes less resistance to airflow. The coupling mechanism maximizes the connexion airtightness and maintains both airflow and pressure over long distances. Even better, the G+ SPEED AIR DUCT stays airtight even when its ends are assembled in a 5° angle. 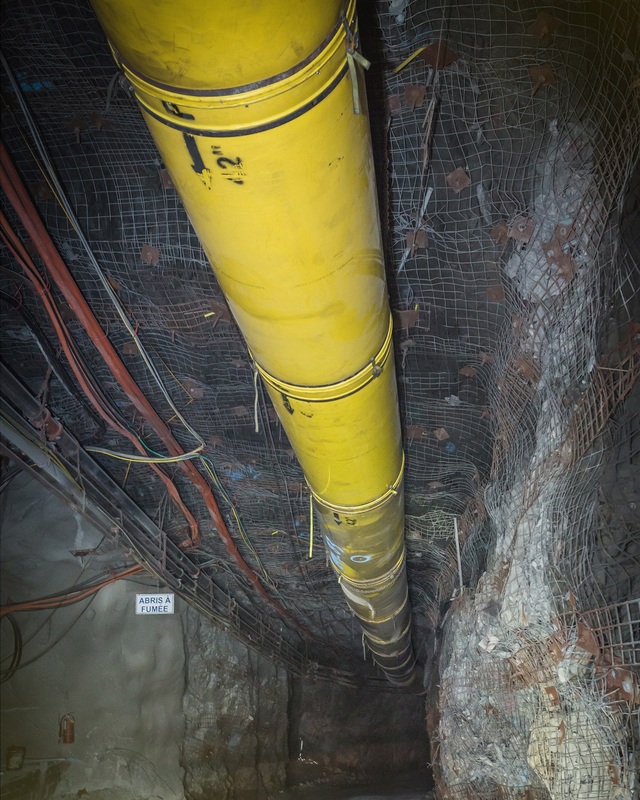 Picture: 54 in vent line in Goldcorp's Borden Gold Project (Chapleau, Ontario). Thanks to its airtightness and smooth walls, the G+ SPEED AIR DUCT conveys air farther than any other duct type, even if assembled at an angle. Because of its performances, the G+ SPEED AIR DUCT delivers a given airflow in ductwork of reduced size. This not only improves ground clearance but can also lead to the design of smaller galleries where vent lines do not interfere with operations. 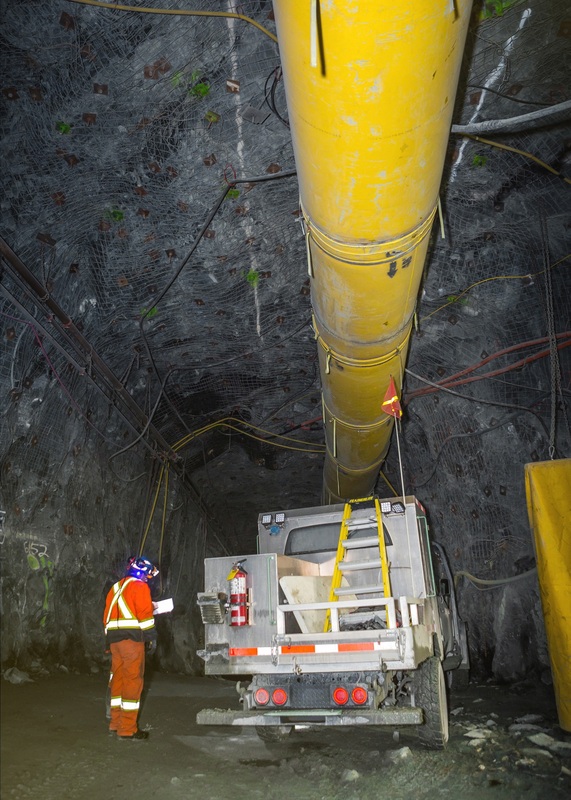 Picture: 48 in ducts in Wesdome's Kiena mine (Val-d'Or, Québec). 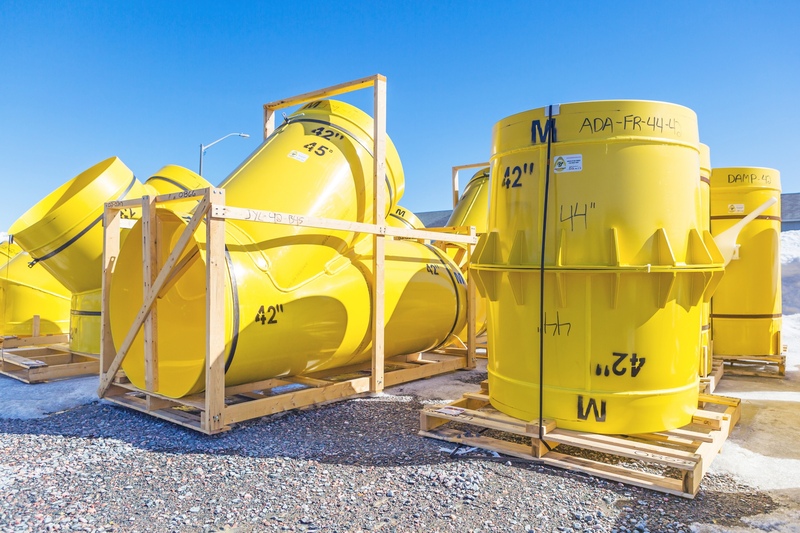 Assembly by CMAC-Thyssen Mining Group. The G+ SPEED AIR DUCT features help moving air farther than any duct technologies while enabling more energy efficient vent lines. First, because fans overcome much less static pressure, a direct result from the smooth duct walls. Secondly, because the G+ SPEED AIR DUCT airtightness prevents the vent line depressurization. Using the G+ SPEED AIR DUCT even leads to a reduced number of booster fans to power a vent line. 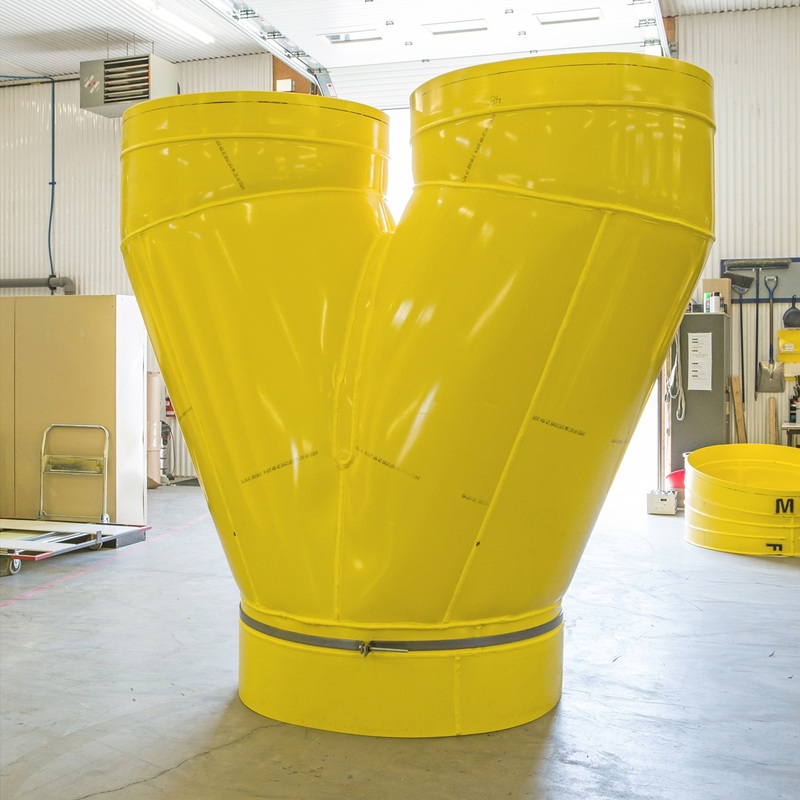 Because of its unique couplings design, the G+ SPEED AIR DUCT can follow a drift curvature without loss of airtightness. No elbows are required for curvature radii equal to or greater than 95 ft (29 m): in other words, each duct can be put together in a 5° angle. 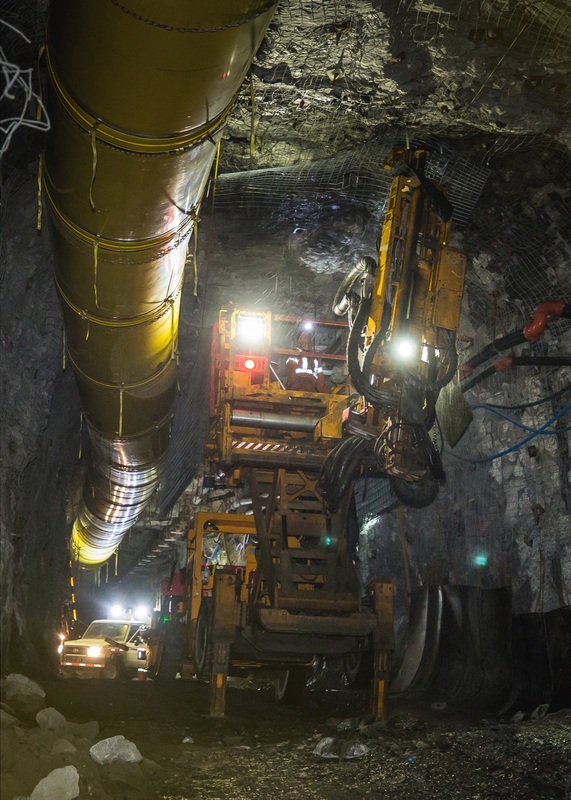 Besides simplifying the underground accessory logistics, such assembly reduces the amount of vent tubing connections, thus decreasing leakage. The G+ SPEED AIR DUCT can take either a round or oval profile with different steel collars. Doing so helps improving ground clearance in high traffic areas without the need of additional adapters. The G+ SPEED AIR DUCT, which contains a fire-retardant additive, complies with the CAN/CSA M427-M91 standard Fire-Performance and Antistatic Requirements for Ventilation Materials. 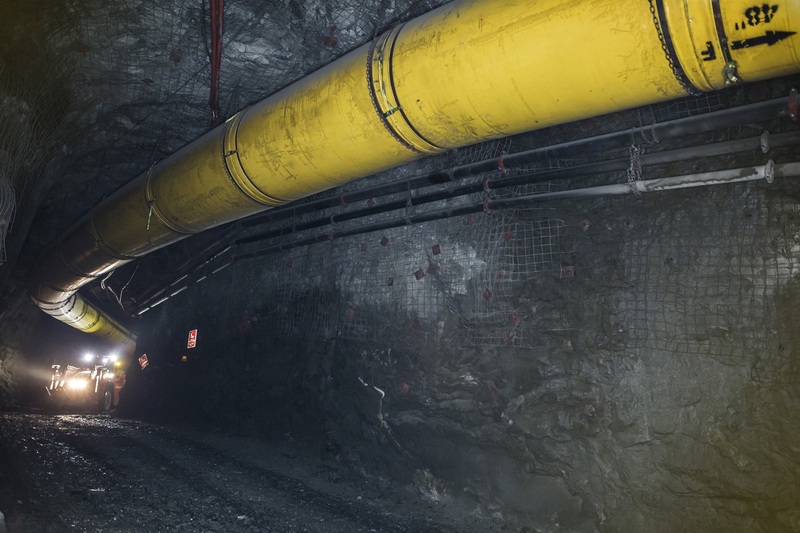 It also fulfills the 30 CFR 7.28 test for the flame resistance of rigid mining ventilation ducts, as required by the US Mine Safety and Health Administration (MSHA). Furthermore, the G+ SPEED AIR DUCT walls are corrosion-proof and impact-resistant; under a large impact, the duct does not burst nor generates dangerous debris. 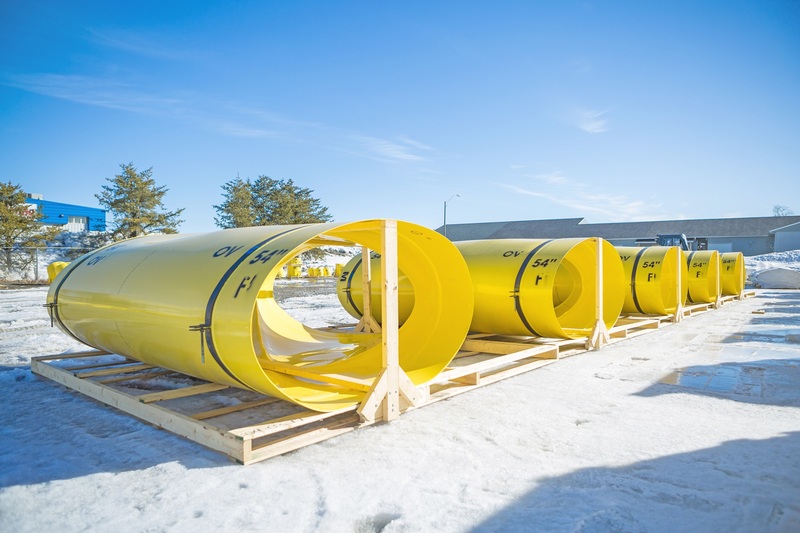 Made of shape-memory plastic, the G+ SPEED AIR DUCT is both lightweight and flexible, which eases both transport and handling, either on the surface or underground. We compressed ducts in crates to maximize volume of shipment. We also offer different packaging methods according to our clients' needs. The G+ SPEED AIR DUCT installation is quick and efficient process as a result of its flexibility and reduced weight. The first step is to roughly reshape the duct after unpacking, and then adding either round or oval steel collars at each end. Assembly continues by inserting the G+ SPEED AIR DUCT male end into the previous part’s female end before securing the connection and ensuring the system’s airtightness using both ratchet straps and screws. The G+ SPEED AIR DUCT robustness increases significantly the vent line service life, which, in turn, leads to lesser production downtime to repair damaged duct. Better, instead of replacing damaged tubing, it is possible to seal their leaks. Despite the repairs, the G+ SPEED AIR DUCT remains airtight and efficient. Mine can also reuse the ducts many times over their service life. 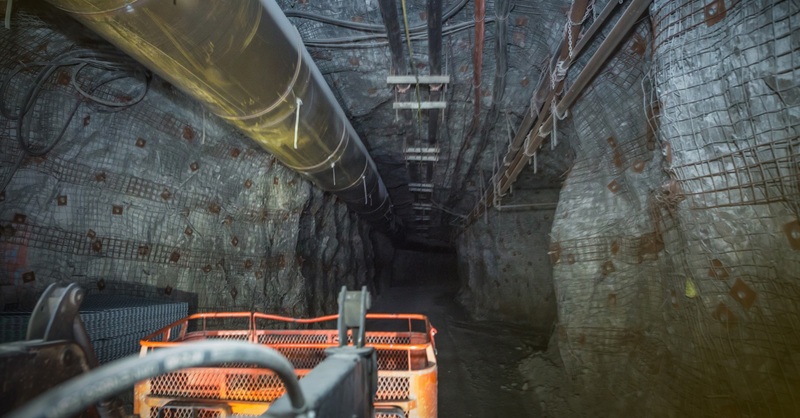 Picture: 48 in vent line in Agnico Eagle's LaRonde mine (Preissac, Québec). 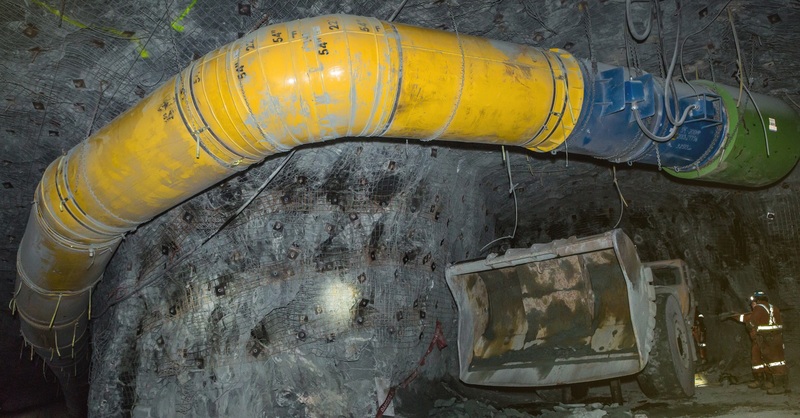 The G+ SPEED AIR DUCT is more than duct: it is a variety of accessories enabling both versatile and high-performance mine ventilation. 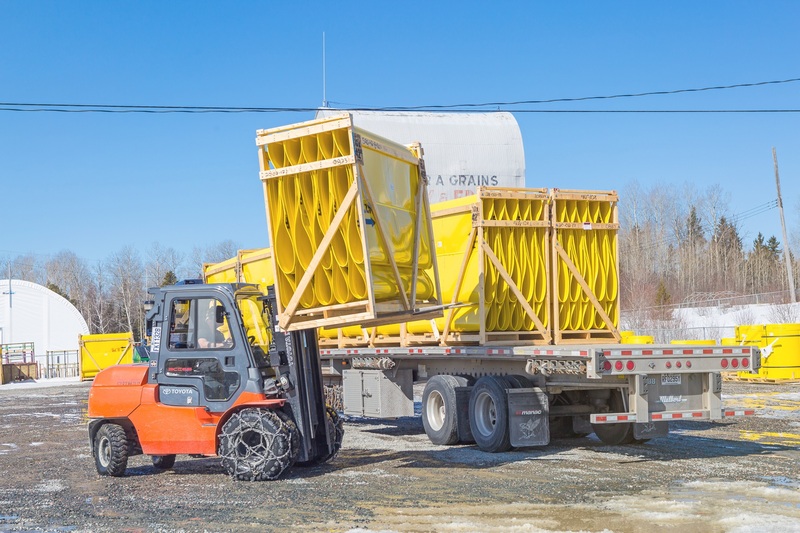 We rely on our extensive experience in custom plastic products manufacturing to design heavy-duty parts that can be reused without loss of efficiency. Choosing the G+ SPEED AIR DUCT also means benefiting from our expertise and our exceptional service. We offer technical support to optimize G+ SPEED AIR DUCT vent line performance. We also provide on-site training for a quick and efficient installation. Finally, when vent lines are operational, we visit our clients to conduct performance surveys and further assist our clients, if need be. In addition, we guarantee the availability of the G+ SPEED AIR DUCT in a timely manner and we adapt billing and delivery according to our client requirements. 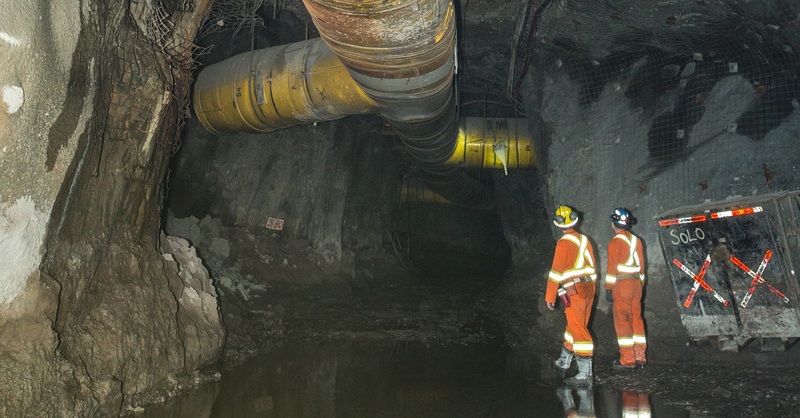 Picture: 48 in vent line in Glencore Canada's Bracemac-McLeod mine (Matagami, Québec).